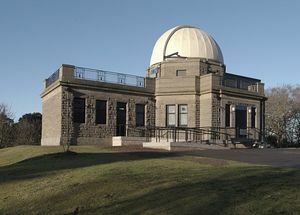 Mills Observatory is Britain's first purpose-built public observatory, gifted to the people of Dundee in 1935. Young and old alike make their way up Balgay hill to the Mills on a clear winter's evening to get a view of the Moon, and perhaps Saturn's rings or Orion's Sword with the excellent Victorian ten inch refracting telescope housed in the Observatory's dome. During the summer months, from April to September, the Observatory is open on selected dates, when visitors can enjoy a varied programme of public events including family workshops, planetarium shows, talks and solar viewing. Organised groups visit the Observatory most evenings and are treated to a planetarium show, an illustrated talk with question and answer session, and a look through the telescope, weather permitting. For those who may be less mobile and unable to access the upper floor of the Observatory to look through the telescope, there's no need to worry. Closed circuit television has been added to give you the opportunity to view the moon and planets at ground floor level, and let you join in the fun and excitement with everyone else! Open on selected dates for a varied progamme of public events. Please check our website for details. Entry is Free to the Observatory and displays. A small charge applies to group visits and public Planetarium Shows. Mills Observatory is located one mile west of Dundee City Centre on the wooded summit of Balgay Hill. Vehicle access is via the gate at Galmis Road, near the junction of Ancrum Road. Ample parking is available.